An academy (Greek Ἀκαδημία) is an institution of higher learning, research, or honorary membership. The name traces back to Plato's school of philosophy, founded approximately 385 B.C.E. at Akademia as a sanctuary of Athena, the goddess of wisdom, north of Athens. Neo-Platonists revived the academy in the late antiquity. Due to the excellence of scholarship associated with the institution, during and after Renaissance, the term academy was used for a school, academic community or organization in the arts and sciences, and research institutions. Before the Akademia was a school, and even before Cimon enclosed its precincts with a wall (Plutarch Life of Cimon xiii:7), it contained a sacred grove of olive trees dedicated to Athena, the goddess of wisdom, outside the city walls of ancient Athens (Thucydides ii:34). The archaic name for the site was Hekademia, which by classical times evolved into Akademia and was explained, at least as early as the beginning of the sixth century B.C.E., by linking it to an Athenian hero, a legendary "Akademos." The site of the Academy was sacred to Athena and other immortals; it had sheltered her religious cult since the Bronze Age, a cult that was perhaps also associated with the hero-gods the Dioscuri (Castor and Polydeukes), for the hero Akademos associated with the site was credited with revealing to the Divine Twins where Theseus had hidden Helen. Out of respect for its long tradition and the association with the Dioskouri, the Spartans would not ravage these original "groves of Academe" when they invaded Attica (Plutarch, Life of Theseus xxxii), a piety not shared by the Roman Sulla, who axed the sacred olive trees of Athene in 86 B.C.E. to build siege engines. Among the religious observations that took place at the Akademeia was a torchlit night race from altars within the city to Promtheus' altar in the Akademeia. Funeral games also took place in the area as well as a Dionysiac procession from Athens to the Hekademeia and then back to the polis (Paus. i 29.2, 30.2; Plut. Vit. Sol. i 7). The road to Akademeia was lined with the gravestones of Athenians. Plato's immediate successors as "scholarch" of the Academy were Speusippus (347 B.C.E.-339 B.C.E. ), Xenocrates (339-314 B.C.E. ), Polemon (314-269 B.C.E. ), Crates (ca. 269-266 B.C.E. ), and Arcesilaus (ca. 266-240 B.C.E.). Later scholarchs include Lacydes of Cyrene, Carneades, Clitomachus, and Philo of Larissa ("the last undisputed head of the Academy") Other notable members of the Academy include Aristotle, Heraclides Ponticus, Eudoxus of Cnidus, Philip of Opus, Crantor, and Antiochus of Ascalon. 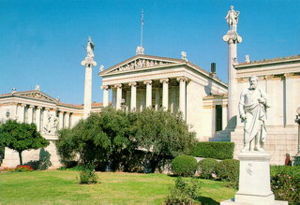 The Platonic Academy may be compared to Aristotle's own creation, the Lyceum. After a lapse during the early Roman occupation, the Academy was refounded (Cameron 1965) as a new institution of some outstanding Platonists of late antiquity who called themselves "successors" (diadochoi, but of Plato) and presented themselves as an uninterrupted tradition reaching back to Plato. However, there cannot have actually been any geographical, institutional, economic or personal continuity with the original Academy in the new organizational entity (Bechtle). The last "Greek" philosophers of the revived Academy in the sixth century were drawn from various parts of the Hellenistic cultural world and suggest the broad syncretism of the common culture (see koine). Five of the seven Academy philosophers mentioned by Agathias were Syriac in their cultural origin: Hermias and Diogenes (both from Phoenicia), Isidorus of Gaza, Damascius of Syria, Iamblichus of Coele-Syria and perhaps even Simplicius of Cilicia (Thiele). The Emperor Justinian closed the school in 529 C.E., a date that is often cited as the end of Antiquity. According to the sole witness, the historian Agathias, its remaining members looked for protection under the rule of Sassanid king Khosrau I in his capital at Ctesiphon, carrying with them precious scrolls of literature and philosophy, and to a lesser degree of science. After a peace treaty between the Persian and the Byzantine empire in 532 guaranteed their personal security (an early document in the history of freedom of religion), some members found sanctuary in the pagan stronghold of Harran, near Edessa. One of the last leading figures of this group was Simplicius, a pupil of Damascius, the last head of the Athenian school. The students of the Academy-in-exile, an authentic and important Neoplatonic school surviving at least until the tenth century, contributed to the Islamic preservation of Greek science and medicine, when Islamic forces took the area in the seventh century (Thiele). One of the earliest academies established in the east was the seventh-century Academy of Gundishapur in Sassanid Persia. 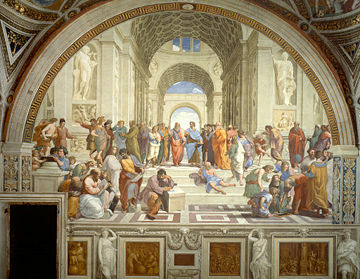 Raphael painted a famous fresco depicting "The School of Athens" in the sixteenth century. The site of the Academy was rediscovered in the twentieth century; considerable excavation has been accomplished and visiting the site is free. It is located in modern Akadimia Platonos. The Church of St. Triton on Kolokynthou Street, Athens, occupies the southern corner of the Academy, confirmed in 1966 by the discovery of a boundary stone dated to 500 B.C.E. The modern Academy of Athens, next to the University of Athens and the National Library forming 'the Trilogy', designed by Schinkel's Danish pupil Theofil Hansen, 1885, in Greek Ionic, academically correct even to the polychrome sculpture. Due to the tradition of intellectual brilliance associated with this institution, many groups have chosen to use the word "Academy" in their name. During the Florentine Renaissance, Cosimo de' Medici took a personal interest in the new Platonic Academy that he determined to re-establish in 1439, centered on the marvelous promise shown by Marsilio Ficino, scarcely more than a lad. Cosimo had been inspired by the arrival at the otherwise ineffective Council of Florence of Gemistos Plethon, who seemed like a Plato reborn to the Florentine intellectuals. In 1462 Cosimo gave Ficino a villa at Careggi for the Academy's use, situated where Cosimo could descry it from his own villa. The Renaissance drew potent intellectual and spiritual strength from the academy at Careggi. During the course of the following century many Italian cities established an Academy, of which the oldest survivor is the Accademia dei Lincei of Rome, which became a national academy for a reunited Italy. Other national academies include the Académie Française; the Royal Academy of the United Kingdom; the International Academy of Science; the United States Military Academy at West Point, New York; the United States Naval Academy; United States Air Force Academy; and the Australian Defence Force Academy. In emulation of the military academies, police in the United States are trained in police academies. The Academy of Motion Picture Arts and Sciences presents the annual Academy awards. A fundamental feature of academic discipline in those academies that were training-schools for artists was regular practice in making accurate drawings from antiquities, or from casts of antiquities, on the one hand, and on the other, in deriving inspiration from the other fount, the human form. Students assembled in sessions drawing the draped and undraped human form, and such drawings, which survive in the tens of thousands from the seventeenth through the nineteenth century, are termed académies. In the early nineteenth century "academy" took the connotations that "gymnasium" was acquiring in German-speaking lands, of a school that was less advanced than a college (for which it might prepare students) but considerably more than elementary. An early example is the two academies founded at Andover and Phillips Exeter Academy. Amherst Academy expanded with time to form Amherst College. Mozart organized public subscription performances of his music in Vienna in the 1780s and 1790s, he called the concerts "academies." This usage in musical terms survives in the concert orchestra Academy of St Martin in the Fields and in the Brixton Academy, a concert hall in Brixton, South London. Academies proliferated in the twentieth century until even a three-week series of lectures and discussions would be termed an "academy." In addition, the generic term "the academy" is sometimes used to refer to all of academia, which is sometimes considered a global successor to the Academy of Athens. In some countries, notably France, academic councils called Academies are responsible for supervising all aspects of University education in a given region. Universities are answerable to their Academy, and the Academies are answerable to the Ministry of Education. (However private Universities are independent of the state and therefore independent of the Academies). The French Academy regions are similar to, but not identical to, the standard French administrative regions. This is not an exclusive use of the word "Academy" in France, note especially Académie Française. In the French educational system an académie is an administrative unit. L'Académie française, or the French Academy, is the pre-eminent French learned body on matters pertaining to the French language. The Académie was officially established in 1635 by Cardinal Richelieu, the chief minister to King Louis XIII. Suppressed in 1793 during the French Revolution, it was restored in 1803 by Napoleon Bonaparte (the Académie considers itself to have been been suspended, not suppressed, during the revolution). 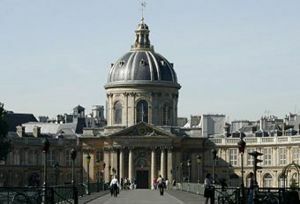 It is the oldest of the five académies of the Institut de France. In Imperial Russia and Soviet Union the term "academy," or Academy of Sciences was reserved to denote a state research establishment, see Russian Academy of Sciences. The latter one still exists in Russia, although other types of academies (study and honorary) appeared as well. As a British school type, privately funded Academies first became popular in the seventeenth and early eighteenth centuries. At this time the offer of a place at an English public school and university generally required conformity to the Church of England; the Academies or Dissenting Academies provided an alternative for those with different religious views, called nonconformists. University College London (UCL) was founded in the early nineteenth century as the first publicly funded English university to admit anyone regardless of religious adherence; and the Test and Corporation Acts that had imposed a wide range of restrictions on citizens who were not in conformity to the Church of England, were also abolished at about that date. Recently Academies have been reintroduced. Today they are a type of secondary school—they no longer teach up to university degree level—and unlike their predecessors are only partly privately sponsored and independent, being partly paid for and controlled by the state. They have been introduced in the early years of the twenty-first century and though mainly state funded have a significant measure of administrative autonomy. Some of the early ones were briefly known as "City Academies." In February 2007, the National Audit Office published a report about the performance of the first academies. In Scotland, the designation "Academy" usually refers to a state secondary school, with over a quarter of these schools using that title as the equivalent of the term "High School" used elsewhere in the United Kingdom. ↑ Simon Hornblower and‎ Antony Spawforth (eds. ), "Philon of Larissa" Oxford Classical Dictionary, 3rd ed. (Oxford University Press, 1996, ISBN 978-0198661726). ↑ See the table in Keimpe Algra,‎ Jonathan Barnes,‎ Jaap Mansfeld,‎ and Malcolm Schofield (eds. ), The Cambridge History of Hellenistic Philosophy (Cambridge University Press, 1999, ISBN 978-0521250283), 53-54. ↑ The Academies Programme, National Audit Office. Retrieved April 10, 2018. Bechtle, Gerald. University of Berne, Switzerland. Rainer Thiel, Simplikios und das Ende der neuplatonischen Schule in Athen. Franz Steiner, Bryn Mawr Classical Review, Stuttgart: 1999. ISSN 0002-2977. Retrieved April 10, 2018. This page was last modified on 24 April 2018, at 19:45.